This page contains guidelines and logistics information for current sponsors. If you are interested as a new sponsor please look at the Sponsorship Opportunities page. Banner ads are displayed on the website and as a static banner on the Beta Sheet newsletter. Banner should be 452 px x 75 px in either JPG, BMP, or PNG format. Logo on conference materials: Supplied as vector file in EPS format OR at 1200 dpi resolution in PNG or JPG format. 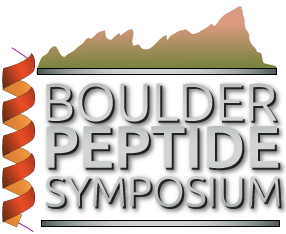 E Mail logos and banner images to admin (@) boulderpeptide.org. Logos and banners shall be uploaded to our website within 14 days of receipt. 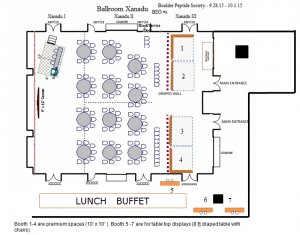 Large 10x6 spaces are provided in the lobby area inside the meeting ballroom. The area is available for setup at 11 am Sept 23 through 11 am Sept 24. Take Down time is between 1-6 pm on Sept 27. Exhibitors are responsible for transporting their own materials and supplies into and out of the exhibition room. Electrical outlets will be provided near each space. To ensure availability please call in your request at least 2 weeks before the symposium. Exhibition displays can be shipped to the St Julien a week in advance. Due to size limitations in the registration packets each pack of literature must be less than 0.25in thick and smaller than 9x11. Please contact us if you need to include a small gift in the distribution (notepads, pens etc). Excess distribution materials will not be returned to you.